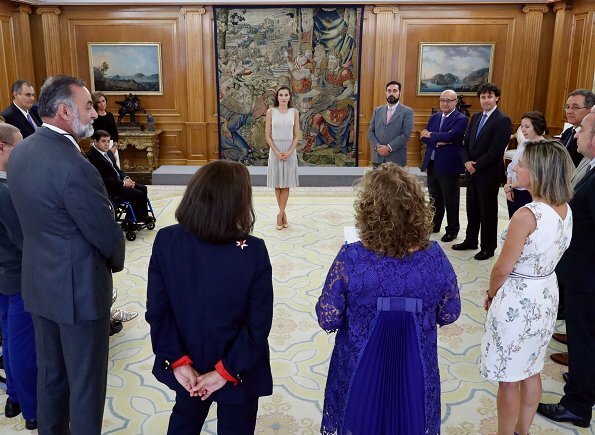 On September 5, 2017, Queen Letizia of Spain met with participants of the "Polar Life Challenge 2017" (Reto Vida Polar 2017) at the Zarzuela Palace in Madrid. Then, the Queen met with representatives of the Board of Directors of Confederation ASPACE (Spanish Confederation of Organizations of Attention to People with Cerebral Palsy) and the company Idai Nature. Está muy guapa y sonriente la Reina Letizia en la rentrée. Me gusta ese vestido sencillo y chic, que estrenó en Méjico en 2015. Bonitos zapatos y pendientes también. The shoes don't match her dress at all. She looks as wonderful as always and the other people in the photos look to be very happy to be there. You're right, Gabriella, the shoes don't quite measure up to that beautiful dress. One thing about this blog, it makes you go further to find out more about the events that are featured. Spain and the Polar Life? Good for them! K Haas, la reina Letizia recibió ayer en audiencia a 3 colectivos diferentes de personas. El "Reto Vida Polar 2017" lo componen un grupo de valientes mujeres que han vencido el cáncer de mama. Las fotos corresponden a los otros colectivos, no a ellas. The dress is simply elegant. She does that look so well. I like the colour of the shoes. They don't exactly match the dress but are in the same colour family - as I see it on my device.